I wish I could go, too, but I'll be stuck here at the Pole helping out at the Workshop. You wouldn't believe how much work we have to do before Christmas. 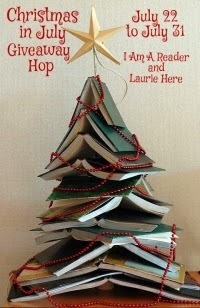 Anyway, here's the back of the bookmark. Click here to see the front, which I posted earlier in the week. 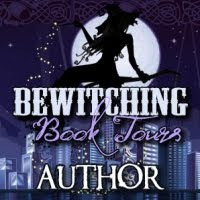 And I'll also have news next week about my FIRST BLOG TOUR!!! Continuing from yesterday, one more important character I have to tell you about is my mom. You know her better as Mrs. Claus. She's like the in-house social worker at my dad's office. For little people, elves have big problems, lol. But seriously, Christmas would never happen if it wasn't for everything my mom does behind the scenes to help my dad pull it off. Even though she never takes any credit for it, she rocks! Then there's my little brother, Frostbite. He's 10. This picture was obviously taken a long time ago when we were both littler, but even now he's still in his I-want-to-be-an-elf-when-I-grow-up phase. He's kind of a nuisance and doesn't have that much to do with the story, except for messing up EVERYTHING. My mom said I had to include him here on my blog or I'd be punished. And my two closest friends in the whole wide world are Tinsel and Snowflake. Snowflake and I have been besties since forever. She's funny, pretty, outgoing. Not as boy-crazy as I am. But that all started to change when Rudy showed up. Like I said yesterday, I didn't like Rudy at first. And Snowflake did. So she sorta got mad at me a little for the first time in our lives. That kinda sucked. But I can't blame her. Because technically, I already had a boyfriend. Tinsel and I had been dating for two years. In secret, of course. Secret from my dad, that is. You know, because my dad thinks I still think boys have cooties. But everyone at school knew about us. I can't remember a time when Tinsel wasn't the most popular boy in class. In elementary school, we all looked forward to his birthday parties the most because the elf side of his family was so much fun to hang around with when we were all still their size. You see, my boyfriend is an elfman. But he's starting to bore me. I can't explain why. Well, yes, I can. It's got something to do with Rudy Tutti. Who Snowflake likes. And I said I didn't. See my dilemma? I can't exactly go to my parents with this one. Come back tomorrow and I'll tell you about the rest of my family. With less than a week till my book is released, I thought now would be a good time to introduce you to some of the key players in my story. Well, I know you already know about this guy. That's my dad. You know he's fat and jolly and brings you toys every year. But you don't know what he's like at home. Sure, he's great when he's bringing you scooters and BB guns and fun things that can kill you. He's a tad more overprotective when it comes to his little princess. For example? Boys. He still thinks I'm too young to go on dates. I'm sixteen. He's probably afraid that if I grow up, I'll stop believing in him, like a lot of kids. Which brings me to the new boy. To be honest, I didn't like Rudy Tutti at all. Not at first. He's not like the other boys at North Pole High. For one thing, he hates everything to do with Christmas, so all of the kids at school used to laugh and call him names. But then Mr. Polar Bear assigned him to be my lab partner for our school Christmas-tree project. And it turns out, Rudy is kind of hot chocolate. Of course, my dad will never see him as anything but a troublemaker — at the top of the Naughty List! OMG! Only THREE MONTHS till Christmas! I hope everyone's warming up their Christmas Spirit. I know I sure am. LMAO. Of course, I always get super excited over Christmas getting closer every day of the year. But today I'm super-duper excited because today is exactly ONE WEEK until my book drops! I've been working so hard on this book for so long, I can't wait for you guys to be able to read it. I really hope you like it. To the right is an EXCLUSIVE first-look at the souvenir bookmark the elves put together. Tomorrow, I'm going to introduce you to some of the characters in my book. Sounds weird to me, calling them characters, since they're all my friends and family. But you know what I mean. LOL. 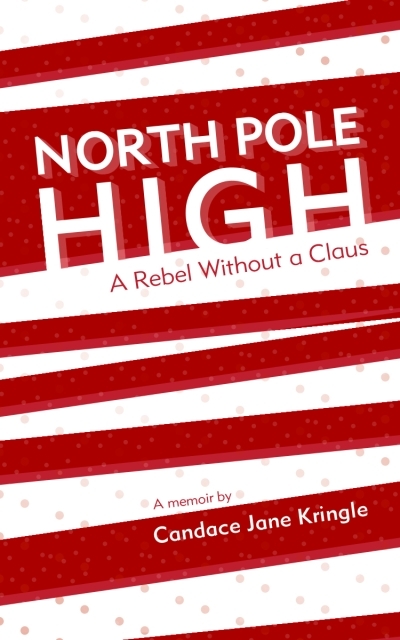 Who wants an ADVANCE COPY of my upcoming new book, North Pole High: A Rebel Without a Claus? 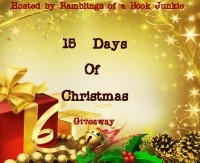 For the next 12 days, starting today, I'm running a GIVEAWAY! I really want you to LIKE me! So for every 50 new likes I get on my Facebook page during this promotion, I'll add another winner -- up to 12 if I reach 600 likes! EXCLUSIVE FIRST LOOK at my BOOK COVER!!! Well, does it make you think of CANDY CANES? 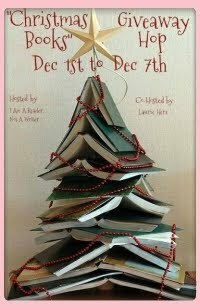 Big *Candy Cane Hugs* to my super creative designer Jessica Weil at jayelleay.com! She's totally on Daddy's Nice List, lol. Now study this cover and remember it so you can look for it on Amazon on October 2, okay?